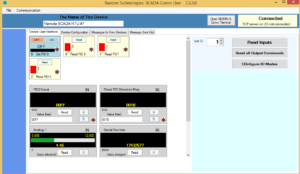 SCADA Comm User is a telemetry software program to help with testing MODBUS and Telemetry communications, Raveon provides a PC program called SCADA Comm User (SCU) for various communication and user interfaces. SCU is designed to testing, developing, and verifying SCADA data communications, including MODBUS RTU and TCP communications with remote terminal units (RTUs) and Raveon radio modems that have the MODBUS communications enabled. Tab 1: Device User Interface. This is the Graphical User Interface, you or SCADA engineers can design and configure. Tab2: Device Configuration: The design tools to design the GUI tab #1. Tab 3: Message In from Device: A display of inbound data from the SCADA device you are communicating with. Tab4: Message Sent Out: A display of the outbound messages, and a table with all the data rows from the last message sent. You can use this to resend the message again, or manually rebuild it and resend it. Very helpful table for technologist’s who want to experiment with SCADA and MODBUS messages. A communication Terminal program is built into SCU, that can be configured to communicate with serial ports, Ethernet terminal servers, and connect with Ethernet clients. Simple to send custom MODBUS messages in any format you want. Able to send any other custom message out. Receives and processes in-bound MODBUS responses, and displays the response. Create a custom Graphical User Interface (GUI) so MODBUS messages can be easily sent by just clicking the created GUI. GUIs to show the response from MODBUS requests. GUIs to allow a user to enter data, click SEND and have the MODBUS message go out. Simple digital GUIs to show status of coils and read status of coils, and set status of coils. View the outbound message history and data. (Messages Sent Out) tab. View the data received in from the SCADA device. (Messages In) tab. Save the GUI designs to the PC, and create other GUIs for other devices, and easily select different devices to communicate with. Communicate with serial or Ethernet devices. The Graphical User Interface Tab has GUI images on them that a technological user an create and setup so the user can easily manage SCADA devices without having to know anything about SCADA, MODBUS, or data communications. Here are some GUI image examples. Analog input GUI, Digital binary output, Coil(bit) input read, Coil(bit) output manage. This SCU program is designed and built for experimenting and testing MODBUS devices such as Raveon’s Tech Series GPIO and FIO wireless RTUs. If you would like to work with the source code, it is open to Raveon’s SCADA suers, so please contact Raveon sales department. If you would like to experiment with this program, click the button below to download SCADA Com User. Download the .ZIP filer, unzip all the files, and store them in a folder on a Windows PC. Click on SCADAComm.exe to run the program. The file SCADAComm.xml Stores the current configuration information for the program. The files with extension .MBXML are used to save the Graphical User Interfaces, and you can setup multiple different GUIs and reload any whenever you want. For more information about MODBUS: MODBUS Information. For more information about Raveon’s SCADA modems with Remote Terminal Unit (RTU) features: Tech Series GPIO Tech Series FIO These products are powerful wireless RTUs that also work with MODBUS protocol messages. MODBUS is a SCADA and Telemetry communication protocol very popular in the SCADA and Telemetry industry. MODBUS is a registered trademark of MODICON, Inc.